Now this was a project. 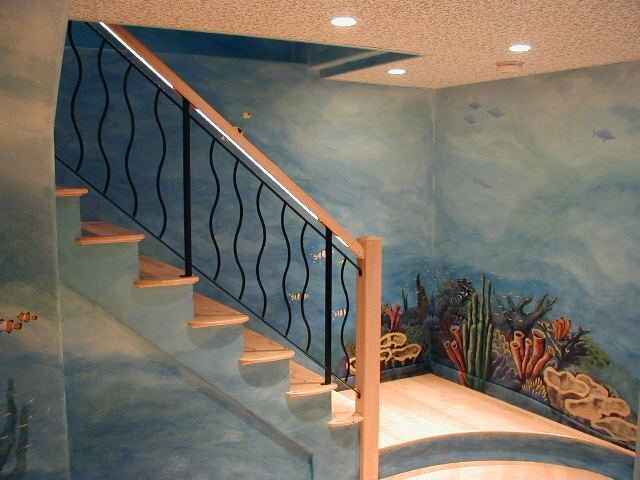 My second staircase and I decided to do something completely different. Something downright underwater. 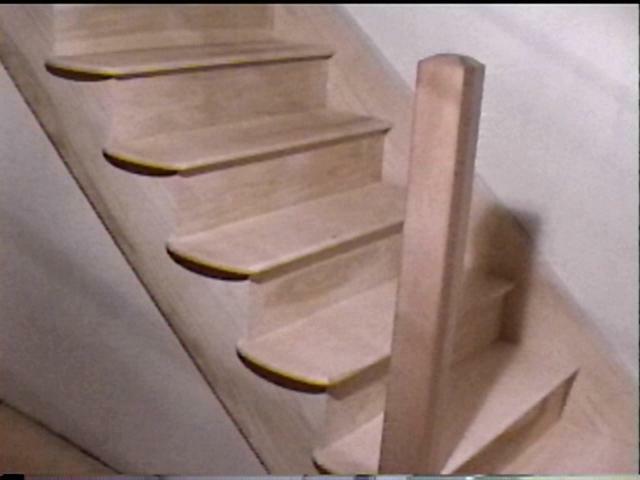 Here is the finished staircase. Each component below has its own page that greatly expands on the construction. If you haven't seen it already on the "Current" page, the full size version of this picture is quite nice - just click on the image. I have to admit, the details of the stair framing are boring - even by my standards. The joint between risers and the finish stringer was excitingly perfect, but this might not justify going to this page with a slow internet connection. The first thing striking about the stair design is the treads themselves. For one thing, I selected more birdseye maple for the wood (I never get tired of that stuff), which meant that the treads would have to be custom milled. The advantage of this approach, though, is that I had the control over the wood selection such that each tread has a maximum of two glue lines running the width (usually one) and each one is made from a single board. Also, there was no reason to be constrained into the classical mitered return (straight back on the tread edge) when I could create something far more curvaceous as an edge treatment. (left) the effect is completely harmonious with the curves everywhere else in the room. You can click on the image to enlarge, but this should almost have its own page. Note how neatly the joint is between the tread and the curved mitered return. 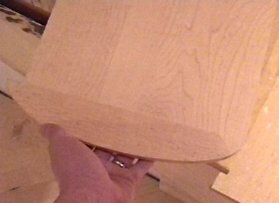 This was done with much better accuracy with a router and pair of jigs rather than the usual circular / hand saw. 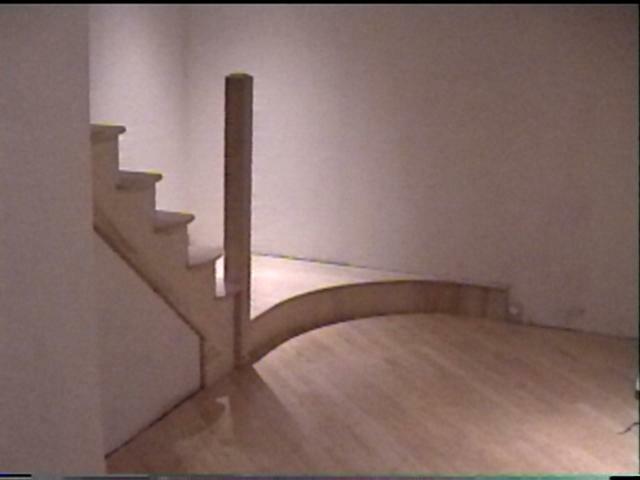 Here is more of an overview of the staircase - along with the custom newel. The newel was also constructed from a single 10 foot board, joined to itself with over 20 biscuits. It is quite rigid. 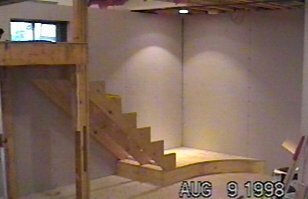 Click on the image to see the construction details of the newel. 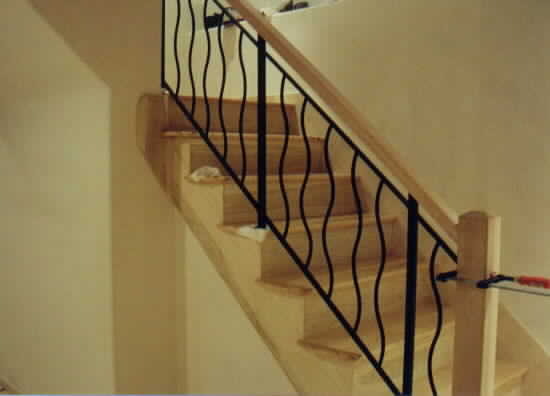 Click the image to explore the design of the balustrade including handrail.